Filmmaker Karel Doing's films capture ordinary images at unusual angles. Musician Pierre Bastien forces unusual objects to act in predictable and fascinating ways. Visions of Doing is perhaps deliberately named to evoke action, despite the fact the “Doing” of the title is not a gerund but a reference to Dutch filmmaker Karel Doing. The pieces featured on the album, conducted for Doing’s films by French sound artist Pierre Bastien, are in constant motion, always doing, moving through the flux of loops and improv. Nevertheless, the mobility of the album gets established through a methodology that may seem unusual for those unacquainted with Bastien's works. A frequent Bastien collaborator is Mecanium, whose organic rhythmic scrapings and shufflings have a singular quality within music. In addition to making odd and slightly detached percussive loops, Mecanium is also a master of various instruments, usually preferring to play in an atonal and seemingly free-form manner. Since the late 1980’s, Mecanium has proved a great partner and a fitting accompaniment to the accomplished Bastien, whose own contributions include mild-mannered avant-garde jazz performed on a variety of global apparatuses such as muted trumpet, Nigerian godje and Chinese lute. The thing is, Bastien’s collaborator Mecanium isn’t a human but a series of music-making machines and doodads built by Bastien, which operate through archaic scientific programming using components like gears and pulleys. The idea of a mechanized orchestra isn’t anything new. In the silent-film era, the Wurlitzer company specialized in manufacturing colossal theatre organs with rows of keyboards that triggered a variety of instruments through the air pressure of an organ’s massive pipes. In addition to organ and piano sounds, the theatre organs’ electro-pneumatic action enabled them to play various percussion sounds, foley effects, such as sirens, and a host of reed and woodwind instruments. Later, the synthesizer consolidated this concept into compact portable casing for easy recreational home use. Bastien’s Mecanium differs from a synthesizer or a theatre organ in that its numerous devices do not require live participation from a musician beyond mere activation. In this sense, the pre-programmed equipment is more like a music box or a Rube Goldberg machine, operating on the principles of cause and effect rather than autonomous selection. Thereby, Bastien’s classifies as a kind of deterministic jazz. Still, this never causes his music on Visions of Doing or any of his past work to sound “manufactured” in that dreaded pop-gloss-contrivance sense of the word. Indeed, the machines, as much as Bastien himself, add a very human sense of warmth and depth to the recordings. The amateur craftsmanship of each device and their failure to lock in sync with each other makes the Mecanium sound gorgeously flawed and more intimately brittle than any manner of acutely engineered electronic sounds ever could. Listen to “The Thermodynamic Orchestra”, and you can hear the sounds of gears grinding against the instruments, the echo of metal fingers plucking and wind being blown in and out of an accordion-like instrument. The incidental field-recording feel of the whole recording is Bastien’s bread and butter. Visions of Doing, being a compilation of artifacts, doesn’t offer a divergence from this time-tested aesthetic, but instead offers a handful of stunning examples of it. “The American on the Highway” sounds like sad-automaton street jazz, played by a beggar outside of Tomorrowland. Bastien whines wistfully through the godje, a bowed instrument that sounds like a cross between a kazoo and a trumpet with a spit valve that needs to be emptied. “Visions of Shanghai” contains a riff a bit like Ryuichi Sakamoto’s theme for Merry Christmas Mr. Lawrence, as interpreted by toy soldiers. There is a disconnect between the listener and the sounds produced by the machines in these tracks. Like a music box, the distance is more physical than emotional space. Emotionally, the listener can feel engaged with the sweet loneliness of material things absent their audience, toys without players, doing without doers. Yet, the physical disconnect between the listener in all his leisure and the laborious production and artful construction of these devices seems vast. Variation in most of the loop-based tracks is subtle, consisting of slight changes to timbre and texture, which is probably more suitable for soundtracks than home-listening projects. Luckily, none of the pieces last very long, and many of them feature collaborative incidental sounds from Doing’s films. “Turkish Boys at the Harbour” is two minutes of splish-splashy sound effects and languid horns burying each other at the shores. “Energy Energy”, the exception to this compositional consistency, gets divided into several chapters, likely at Doing’s doing, and jumps around like a playful menagerie medley of noise. It includes a quotation from “Morceau En Forme De Pinces” off of Bastien’s album with French jazz duo Klimperei and appears almost magically after Bastien’s robots start metronomically swaying with clockwork precision. As the melody winds down, taped voices asking, “Everything okay?” ominously arise from the mist. As a bonus, the disc features a CD-Rom video of Doing’s film Four Eyes, a piece which offers a split screen of people being transported by escalator and Mecanium gears striking a keyboard at odd intervals. 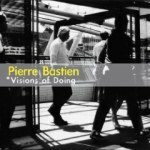 With Visions of Doing running only 36 minutes, why Bastien didn’t include the stirring work on the actual CD remains unclear, but the track seems better suited with its visual accompaniment. In fact, even the least interesting pieces on the album still leave one wondering what visions from the album’s title one is missing.